Don’t worry about the curly think snapping out like a frog’s tongue i n pursuit of a fly; that’s just the curly bit on the front of the Red Crown of Lower Egypt, which Atum is wearing in the picture. It’s another easy to draw sign; a tall, thin rectangle with a v neck, and a short stroke (or, sometimes, a cross) inserted into the v, and a line about halfway or two thirds of the way down, marking the border between the different colours with which the pillar is painted. We’ve had the second hieroglyph before, but lying on its side and standing on one foot – a real contortionist of a sign. It’s the little water pot which formed part of the word wcbt, wabet, pure in the offering formula. Standing up on its own two feet (but without the feet) it reads nw, nu, reinforcing the n in Iunu and adding the sound u. The final hieroglyph is the place determinative, a circle with an x in it, representing a town wall and a crossroads, which we’ve seen before in Djedu and Abdju, Busiris and Abydos, in Osiris’ titulary. So the whole group reads ‘Iwnw, Iunu, the ancient Egyptian name for the cult centre which eventually became know throughout the Greek-speaking world as Heliopolis, the City of the Sun. 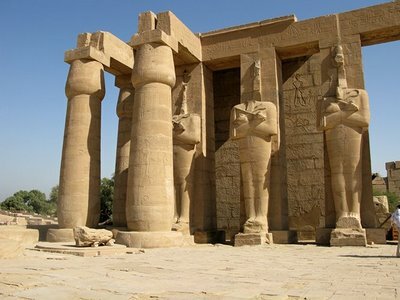 Heliopolis was one of the most important cult centres of ancient Egypt, the site of the first known sun temple and sacred to the solar cult. The position of the sun was far too important a celestial occupation for just one god. As well as Atum, the elderly god of the setting sun, there was Harakhty or Horus of the Horizon, god of the rising sun; Khepri, the scarab beetle who rolled the sun across the sky at midday, and the generic sun gods Re, (known to the producers of Hollywood epics as Ra) and Aten, credited with being the god of the first monotheistic religion. Now that’s job sharing. According to the ancient Greeks, Heliopolis was the destination of the phoenix, the sacred bird which, when old, flew to the temple of the sun god to burn itself upon the solar altar and rise again from the ashes. Now it’s mostly buried under Cairo airport, and all that flies in there these days are planeloads of tourists. One obelisk is the only thing of any size now visible, but there are others closer at hand depending on where you’re reading this); Cleopatra’s Needle on the banks of the Thames in London and the obelisk in New York’s Central Park both came from Heliopolis. The origin of the legend of the phoenix was probably the bird known to the ancient Egyptians as the benu bird, a sacred heron associated with the sun cult. The legend lives on @Bennu on Twitter!